It is said that seeing is believing. Build your very own physical temperature gauge (complete with arrows and dashboards) using the servo module. The servo motor will rotate according to the input temperature levels from the micro:bit temperature sensor. Using the map function, the range of integer values for the temperature will be scaled proportionately to match the rotation of the servo motor. Click the button below to download the Dr Bit solutions for this challenge. The Dr Bit file is contained within a zip folder. To download Dr Bit PC software kindly click hear. To download the Dr Bit app kindly select one of the links below. 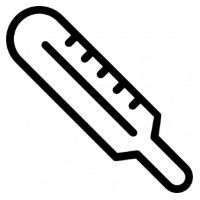 As the micro:bit’s on-board temperature is inferred rather than taken from a dedicated component, the temperature may not necessarily be accurate. One way to improve the accuracy is to use an external thermal sensor.